Cut flowers and arrangements are available at Maxine's Blooms. At the Thornton Farmers Market, the only way you could get closer to nature is if you pulled the vegetables out of the ground yourself. Shopping at the outdoor market, which is held every Saturday in a field on Glen Mills Road, is a chance to meet the farmers, artisans and chefs who provide all the farm-fresh products. For the past nine years, a growing list of vendors and shoppers have made the market a must-see destination. 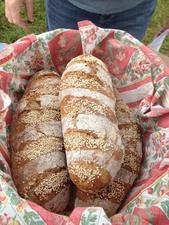 Fresh-baked breads from The Rustic Oven. Donna Wetterlund is the market manager and a vendor, selling Bruno Bits All Natural Dog Treats. "We are a family-friendly destination, not far from West Chester and Chadds Ford," she said. "Our patrons tell us that we are the friendliest farmers market that they have ever been to, and everyone enjoys petting our alpacas and tasting samples from our vendors." Everyone loves to visit with the gentle alpacas from Trotter Hill Alpacas, and shop for handmade wool products. But shoppers can also find hearth-baked breads by The Rustic Oven, barbeque by Flat Rock Grill, southern-style macaroni and cheese from Three Sisters, sweet treats from Edie's Sweet and Savory Pastries, natural produce from Misty Hollow Farm and Moriah's Horse Powered Farm, and handmade soaps and fragrances by Urban Essence Salon and Spa. There's also African gifts, coffee and spices at JB's Afrikan, local honey from Carmen B's Honey, and wood crafts by Lloyd's Woodcrafts and The Woodworm Workshop. Local musicians also perform for shoppers on the shady lot. "Each year we get bigger and better, and thanks to the generosity of Thornbury Township, we have set up shop on our largest site yet," Wetterlund said. "This season we have added a picnic pavilion for visitors to relax and enjoy lunch or a snack in the shade. You get to speak directly with the producers of what you are buying, and we are all thrilled to discuss our products. You don't get that at the grocery store." Maxine Manges is the founder of the market, and sells fresh flower arrangements. "Having just read Animal Vegetable Miracle, by Barbara Kingsolver, in 2004, I thought it a great idea to sell the abundance of tomatoes and zucchini that were appearing on doorsteps and in mail boxes," Manges said. "The price by the pound for a water-filled, store-bought tomato, when they are so abundant, seemed nonsensical. Secondly, I have always wanted to sell flower arrangements in reused vases, so with those two sources in mind, we started the market on the grounds of the AME Church in Glen Mills. "The market grew quickly. Success brings traffic, so we moved last year to the township-sanctioned annex to the park called The Cannon Property," Manges said. "We are a gathering place for weekly visitors. Although a farmers market is mostly about growing edibles, the second important concept is that entrepreneurs start their own businesses, generate customer bases, and have the opportunity to play at the game we all loved as kids -- setting up shop. The community gets to know itself, and the summers are defined and cherished for the brief period they are. It is a good thing all round." 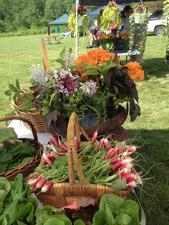 The Thornton Farmers Market, with more than 20 vendors, is on Glen Mills Road between Thornton and Cheyney roads. It is open on Saturdays from 11 a.m. to 2 p.m. from May 9 to the end of October. For more information, there's a Facebook page (www.facebook.com/thorntonfarmersmarket), where updates are posted each week. To contact Staff Writer John Chambless, e-mail jchambless@chestercounty.com.